This blog post is going to be shorter than it could be, but for once in my life I’m going to hold back some information. I wouldn’t want anything I might say to jeopardize the closing of our house! So we are closing on the 31st of this month. I went out to Colorado last Friday and went on the home inspection. 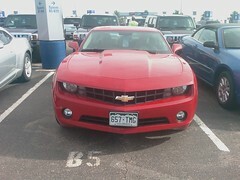 I had a good day, this was my rental car! I won’t get into too many details on the inspection for a number of potential reasons, but it went very well. Nothing too major was found, and the one item we wanted inspected is getting replaced! Now we’re in the bind of figuring out how we are going to get to Colorado for closing, hopefully with all of our furniture at the same time. We’re currently planning on loading up the horse trailer and a budget rental truck with all of our stuff, putting the 240Z (www.project240z.com) on the car trailer, and drive all three rigs out the day before closing. We might leave even a day earlier, but in order for that to happen I have to rearrange a work trip that is scheduled Mon-Wed the week we close (we close on Friday). I hope to know if I can rearrange that trip tomorrow. So we’ve started packing, throwing lots of things out, reorganizing what we have, and want to take with us. We’ve got a long way to go, but I think we’re making good process so far. I’m hoping to get the Datsun back together this weekend and to spend the weekend packing up the garage. If I can get that done it will leave my office, and then clothing. Hopefully Natalie will tackle the kitchen this coming week! Natalie’s last day at the barn working is tomorrow, it’s a big change for her, not working every day. I look forward to seeing more of her!